I was very excited (and nervous) about this meeting with Roberta Rich. I love meeting people, especially authors, but one on one is a bit intimidating. I still feel like I’m pretending to be a writer, as a blogger, and this lady is definitely the real thing. Would I think of good questions? Would I remember to let her talk (once you get me going, duct tape is occasionally necessary, particularly on the topic of books)? Thankfully, even if I had no idea what I was doing, she definitely did. I brought up her former law career, and the fact that most lawyer/writer transitions ended up with legal thrillers. 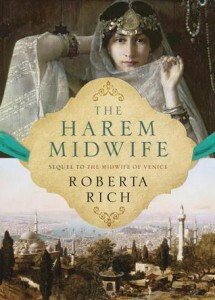 Instead, she went with a midwife in 16th century Venice. RR: There is a bit of legal… there’s a bit of Jewish law in The Harem Midwife. You know, when I started writing, I was writing mystery stories, contemporary mystery stories, and I was writing… those were about a divorce lawyer in Vancouver. Those are still in my filing cabinet, and have yet to see the light of day. And in 2007 I was in Venice and I was in the Jewish ghetto and I was quite transfixed by it, and had the idea for a novel that was set in the ghetto. I kind of wrote the novel that I wished had been available for me to read, because there are no novels that are set in the Jewish ghetto except for mine… It is a rich environment and I was quite surprised that I didn’t find anything. This is a gap. This was definitely a gap. I told her I liked how she presented the conflict between morals and law, in both books. Hannah, the midwife in question, keeps coming up against the laws of the country, the good of her family and community, and having to balance them against her moral duty, her ability to help people. Should she do nothing, in order to protect herself and her family and community, or should she help when able? Particularly at the time these books are set, as a member of the Jewish community a wrong action on her part could set off retribution against everyone Jewish. This is still relevant today, that conflict between what is legally right, and what is morally right. That need to be aware of your effect not just on your own sense of right and wrong, but how your actions could potentially, for good or ill, affect everyone around you, particularly in this age of social media and instant fame. Which, of course, us being in Toronto, brought up Rob Ford. RR: It’s very hard to turn around these days without seeing Rob Ford’s (unflattering mutter) face everywhere you go. He’s shameless, really, isn’t he and there are people who think it’s okay! We don’t want an average guy running a city. We want superior guys, right? Exactly, Roberta. Can we get her on the voter’s list, somehow? So, back to the books. I told her I had been up ridiculously late reading her books, had, in fact, read them back to back. RR: Did you read them in sequence? BP: There are people who read books out of sequence? But yes. So told her that I preferred The Midwife of Venice, because her descriptions were so vivid, I felt like I was right there. The Harem Midwife was also excellent, but was a little more plot focused, with a little less character development. 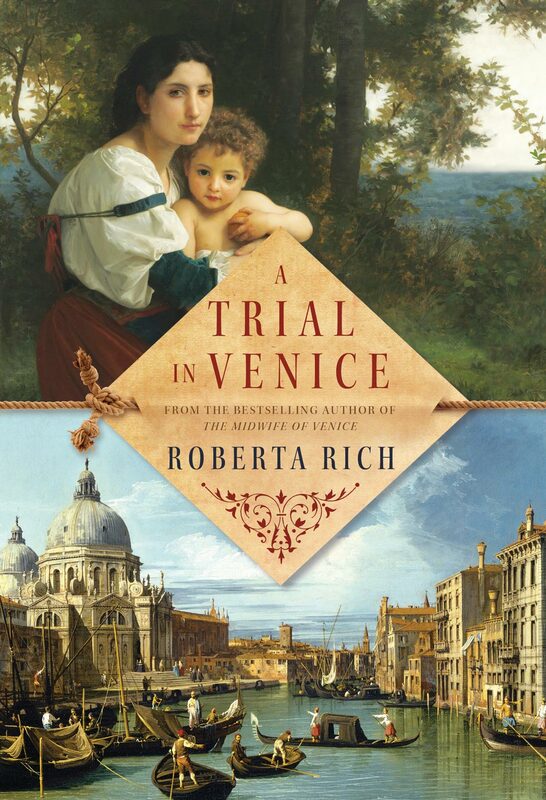 In The Midwife of Venice, I felt immersed, I could see the sights, smell the smells. BP: One of the reasons I really enjoyed your books is because it’s funny, you think that all that stuff is in the past, but it’s not as in the past… as we would like to believe. Like polygamy. RR: Polygamy is an interesting topic for me. The idea of the levirate marriage, for example. I was talking at a book club in Toronto last year, about the idea of a levirate marriage, and a woman at the book club, who was Muslim, and her family was from India, said that that had happened in her family. So, levirate marriage, which happened five hundred years ago in my book, is something that happens in modern life. There are… so called “honour killings.” It’s a terrible name for it, it’s a dishonour, not an honour killing. I told her about the hymen repair surgery specialist in Toronto (Do you think it’s too late for me?” she snickered). The idea of virginity being a vital commodity is raised more than once, particularly in The Harem Midwife. RR: I’ve spoken to a couple of doctors about this. There is no real way to tell from examining a woman whether she is a virgin or not. Girls that are sporty and athletic probably don’t have hymens that are intact. It’s not a thing that you could tell. When you see women as property, it suddenly becomes very important. We moved on to the book business. Amazon (my nemesis) was a topic of conversation. RR: Amazon is really selling at a loss, they don’t care what they sell their books for. There have been a number of articles about Amazon recently, and their labour policies, which are nasty, nasty. They’re paying some kids minimum wage to work in these vast warehouses, they’re under the gun, time-wise, they’re – I couldn’t believe this when I read it – the one in Arizona is not air conditioned. That’s a serious problem in a place like Arizona. These kids are running around, running around, running around… they have a beeper that tells them how long it should take them to get to a particular stack of books, get a book, and put it in a box, and if they don’t make that, that time limit, they get beeped! I think that would make me crazy. I mentioned Chapters Runnymede’s imminent closing, and recommended she visit She expressed disgust at it being turned into a drug store. “Oh god, oh that’s so depressing. ” were her exact words. Right there with you, Roberta. RR: I thought, two years ago (I don’t really know anything about the business from before two years ago) I thought e-books were going to take over, take over, take over. And it was twenty percent then and it’s forty percent now but I think, it seems as though it’s going to continue at forty percent. People like holding a book in their hands. And it’s not just people my age. It’s also young people. With social media… I often wonder how much information… well, there’s a tremendous amount of information about me, I’m sure. For anybody who’s interested in finding it out. But, we’ve sacrificed privacy for convenience, haven’t we? That’s the trade-off that most of us have made, myself included. I recognize the irony that this article is being shared on at least three different types of social media. I gave her, as a souvenir of Toronto, a maple bacon chocolate bar, which considering that they’ve been making maple-bacon flavoured everything here the last while, including a burger at the Ex, seemed quite apt. She did a credible imitation of being glad to get it, which I hope she was, but you know, not everyone thinks maple bacon chocolate sounds wonderful. We chatted about Toronto, and its historical buildings, and from the window I pointed out the church spire that used to be Toronto’s tallest structure. She said she thought that Toronto had done a better job of maintaining its history than Vancouver (her hometown), and was enjoying her visit greatly. She was staying with a friend in Toronto’s Cabbagetown area, and had determined that if she ever lived in Toronto, that is where she would live. She had a quick glance at my web site, and thought it was hilarious that the first article that popped up was the one about copies of Fifty Shades of Grey in the library having herpes virus. She teased me that I was supposed to be encouraging reading, wasn’t I? I said Fifty Shades was an exception to that rule. She said she read the first chapter, it was available as a free download, and thought it was boring, and the heroine insipid. She’d had people tell her, a hairdresser, for example, that it had just aroused them incredibly, which she found laughable. ”It obviously doesn’t take much to arouse them, does it?” Did I tell you I love this woman? We parted after an hour. I thoroughly enjoyed the interview. She headed off for lunch, and I headed home, very impressed. Roberta Rich is a hell of a woman, and a hell of an author, and you should go buy her books. Happy reading – and thinking!